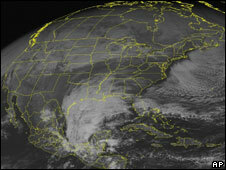 The eastern United States is preparing for a major winter storm moving up the Atlantic coast. Virginia Governor Timothy Kaine declared a state of emergency as forecasters predicted up to 20in (50cm) of snow in some areas of the state. The governor placed the National Guard on stand-by, warning that snow and high winds could cause power outages and other serious problems. Blizzard watches are in effect in Long Island, Rhode Island and Massachusetts. The US National Weather Service said the storm system over the Gulf of Mexico was forecast to move north through the south-eastern US on Friday, hitting the North Carolina coast by Saturday morning and reaching as far north as Massachusetts on Sunday. Heavy snow is expected to fall from North Carolina to New York, with major cities including Baltimore and Philadelphia bracing themselves for a foot (30cm) or more. Washington DC is preparing to be hit by what could be its worst winter storm since the capital was covered in 27in (68cm) of snow in 2003.